Well-drained soil enriched with plenty of compost to lower pH. Rarely necessary. Peanuts are a nitrogen-fixing legume. Beet, Cabbage, Carrot, Celeriac, Celery, Corn, Cucumber, Eggplant, Lettuce, Marigold, Peas, Rosemary, Radish, Strawberry and Tansy. Start indoors and transplant outdoors into a hill or mound after the soil has warmed in early summer. In climates with warm summers direct-sow peanuts in early summer. 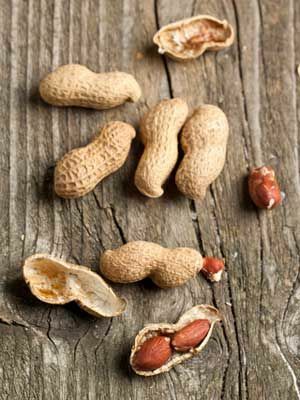 Peanuts require at least 120 days of hot weather and ample rainfall to crop well. Regular hoeing is needed, because the stems of peanut flowers bend over and “plant” themselves in the soil. Harvest when the leaves turn yellow and die back, or immediately after the first frost. Shake off soil, gently rinsing if necessary, and dry the whole plants in a warm, well-ventilated area for one to two weeks. Remove the peanuts, and continue drying them in a single layer until the shells are crisp. Moldy nuts should be disposed of immediately as they can be toxic.